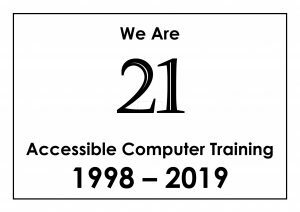 It’s 21 years since Cambridge Online first started providing accessible computer training! In advance of celebrations later in the year, we are collecting quotes from learners, volunteers, supporters and partners. The quotes will be used on a Celebration Quotes Wall at our main learning centre and on our website. If you would like to contribute, please send your quote to us, along with your name and connection with us – you can be anonymous if you prefer. Click here for contact details.